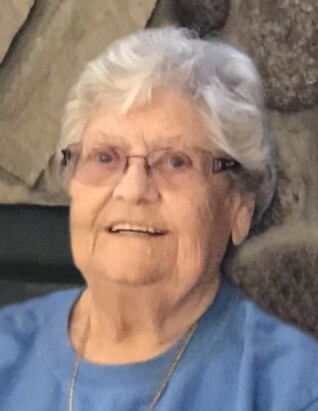 Marion J. Ash, 89, of Carlsville, died Sunday, January 20, 2019 at Door County Medical Center in Sturgeon Bay. She was born June 19, 1929 in Sturgeon Bay, the daughter of Joseph and Edna (Stegmann) Rockwell. She married Aldred “Al” Ash on October 10, 1953 at St. Peters Lutheran Church in Sturgeon Bay. Al preceded her in death on June 13, 2011. She and Al owned “Ash’s Bar” in Little Harbor and also developed housing properties in Door County. Marion enjoyed cooking and baking and was known for her tasty banana bread. She also loved gardening and growing beautiful flowers. During the winter months, Marion enjoyed spending time in Clearwater Beach, FL with her husband, Al. Fishing was her favorite pastime in Florida, as well as her home in Door County. She was a talented painter, loved jigsaw puzzles, as well as making and selling jewelry. In her later years, she enjoyed caring for her grandchildren. She leaves her five sons, Allan (Linda) Ash of Luxemburg, Randy (Linda Duke) Ash, Douglas (Kay Radtke) Ash, both of Sturgeon Bay, Daniel (Pamela) Ash of Egg Harbor, Walter (Nancy) Ash of Sturgeon Bay; eight grandchildren, Autumn and Adon Ash, Jason Ash, Kelly (Austin) Gross, Taylor (Nick) Havel, Alexander (Corrine) Bruckner, Griffin Ash, and Quincy Ash; great-granddaughter, Brynleigh Ash; and three sisters, Ruth Smith, Dorothy (Jim) Kintopf, and Joan Krueger. Marion was preceded in death by her parents, Joseph and Edna Rockwell; two-year-old daughter, Luann Ash (1956); sister, Mae Haase; and four brothers, Leo, Gene, Jack, and “Butch” Roy. Her life will be honored with a funeral service held at 11:00 a.m. on Friday, January 25, 2019 at Huehns Funeral Home in Sturgeon Bay. Burial will be in Bayside Cemetery. Friends may call from 5:00 p.m. until 8:00 p.m., Thursday, January 24, 2019 at Huehns Funeral Home and on Friday from 10:00 a.m. until the time of service. Memorials may be given in her memory to American Legion Post #72, Sturgeon Bay. Expressions of sympathy, memories, and photos of Marion may be shared with her family through her tribute page at www.huehnsfuneralhome.com.